Add sausage, breaking up into bite sized pieces, and brown for about 5 minutes. Add garlic, oregano, and red pepper flakes. Cook for 1 minute. Add tomato paste and stir well to incorporate. Cook for 3 to 4 minutes, or until the tomato paste turns a rusty brown color. Add diced tomatoes, bay leaves, and chicken stock. Stir to combine. Add uncooked pasta and cook until al dente. Do not overcook or let soup simmer for a long period of time at this point, as the pasta will get mushy and absorb all the soup broth. You may even want to consider cooking the noodles separately, and then adding some to individual bowls before ladling the soup over them. This would be an especially smart move if you are anticipating any leftovers. While the pasta is cooking, prepare the cheesy yum. To serve, place a dollop of the cheesy yum in each soup bowl and ladle the hot soup over the cheese. 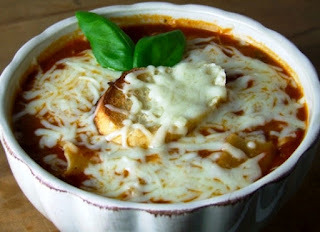 Add an slice of french bread and sprinkle some of the mozzarella on top.